The All Growed Up pilot was nominated for "Outstanding Children's Program" in the 2002 Creative Arts Emmy Awards, which were presented on Saturday, 9/14/2002. But unfortunately, they lost. For details, click here. 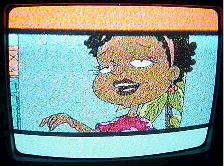 "To Be Continued" -- as "All Grown Up"
The All Growed Up special was not only the highest rated Rugrats episode ever, it was also the highest-rated program ever on Nickelodeon, just enough to make it cable's # 1 show for the week ending 7/22/2001. And because of these ratings, you can count on the return of the tweenage Rugrats. A TV series about the tweenagers will go on the air in late 2003 -- 13 episodes have been ordered (production commenced in September 2002), and their first season will begin in 2003. However, the series will now have a gramatically-correct name -- "All Grown Up". For details on the All Grown Up series, click here. NEW YORK, Wednesday July 25 1:57 AM ET (Variety) - Nickelodeon's Rugrats solidified its hold as the highest-rated programming franchise in cable history by scoring a huge 7.2 rating in cable homes for All Growed Up, a one-hour primetime special this past Saturday. The rating is equivalent to more than 12 million viewers, and the special reached 70% of kids aged two to 11, the cable channel said Tuesday. 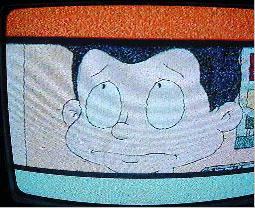 Nick's previous record was a regular Rugrats episode, which reached 5.4 million viewers in 1999. 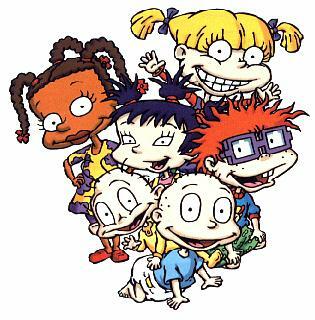 The Rugrats special delivered more households to Nickelodeon than any other program in its history, giving the network a rare first-place victory in primetime among all basic-cable networks for the full week ended July 22. Nickelodeon averaged a 2.3 rating for the week, edging Lifetime with a 2.2. Closely bunched between third and sixth place in primetime were USA (a 1.9 rating), TNT (1.8), Cartoon (1.7) and TBS (1.6). Lifetime had the highest-rated primetime movie of the week, Dangerous Child, with Delta Burke, chalking up a 5.2 rating in cable homes July 16. While Nickelodeon won the primetime race among households, it ended up only in fifth place among the coveted adults 18-49 demographic and sixth place among adults 25-54. USA finished first in the adults 18-49 category, and TNT was first in adults 25-54, both in primetime. But All Growed Up was the big story of the week. Nickelodeon said the special's 70 share among kids 2-11 represented the highest share ever recorded for a cable TV program. And the special came in as the second-highest-rated program of the year in all of cable, beaten only by TNT's Crossfire Trail, with Tom Selleck, on Jan. 21. 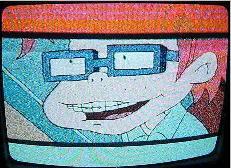 All Growed Up, which projected the Rugrats characters 10 years into the future, will serve as a pilot for either a regular spinoff series or a series of occasional one-hour specials, Scannell said. On 10/16/2001, a PC game based on the All Growed Up special (or a "three-part episode airing this fall" according to the game's producers, THQ) will be released. The computer game, for at least Windows 98 and Me, wil have Mr. Spooky's time machine turn the Rugrats into tweenagers. For more details, see my game page. After the tweenage Rugrats wowed fans throughout the US, there's nowhere else to go but up -- north, that is. 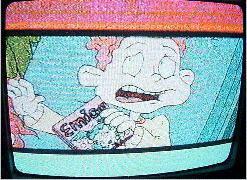 About a month after the video release in the US & Canada, All Growed Up had its Canadian television debut on YTV, Rugrats' English broadcaster in Canada. YTV premiered the episode on Labour Day, Monday 9/3/2001 at 12 Noon ET. For French-speaking viewers, "Les Razmoket, Dix Ans Après" made their French appearance in 2 parts on VRAK.TV -- 12/1/2001 & 12/8/2001. 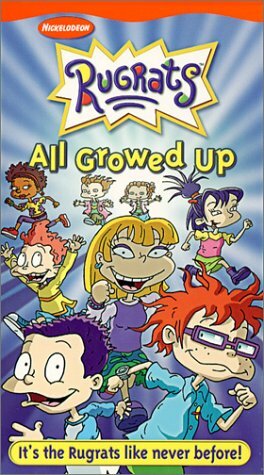 In Britain and, later, Australia, the video will be known as "Older And Bolder"; the reason being is that there is already a Rugrats video on the market in those countries that is named "All Growed Up". The contents of "Older And Bolder" is the same as the US "All Growed Up"
video. Also, the episode itself will still be called "All Growed Up" in the British version. 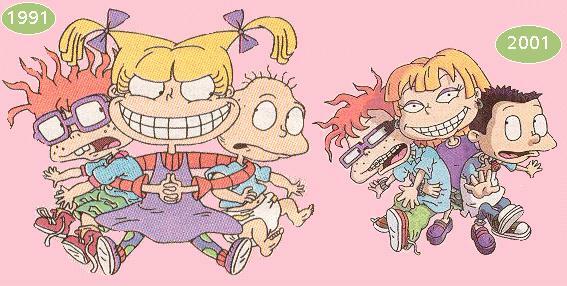 Here is another "then and now" pose of the regular and tweenage Rugrats, minus Phil & Lil. special, and the 10th Anniversary, like they never did before. something like, "Wait 'till you see them ten years older"; then, the "camera"
when to catch the special. offering the "gold" e-cards (click here). fans in suspense, it, more or less, backfired. clips, caught with an aid of a VCR. (Left & Top Above: Screen grabs of an All Growed Up ad from Nick. 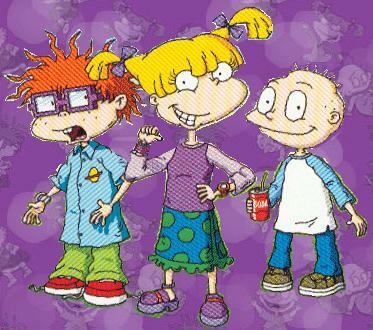 Are the Tweenage Rugrats the Future "Rugrats"? 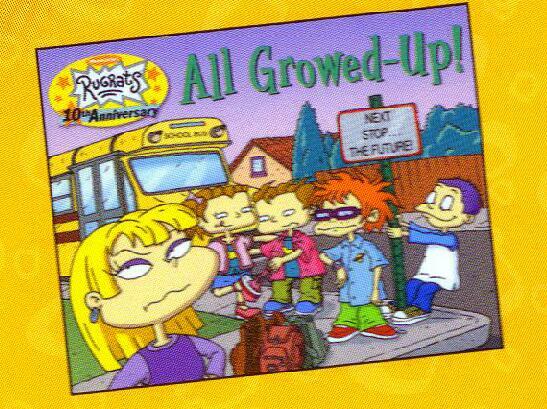 In Nick's press releases for the Rugrats' 10th anniversary, it mentioned that the All Growed Up special will be a "one time only" special, where the Rugrats appear as tweens for one episode only. 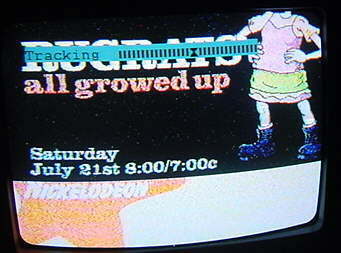 According to Tvinsite.com, Nickelodeon executives at the Television Critics Association tour in July 2001 mentioned that All Growed Up is actually one of three spinoff concepts proposed by Nick to keep the successful Rugrats franchise rolling. And if ratings for the All Growed Up special are any indication, look forward not only to a new series, but also to a new merchandising line based on the show. 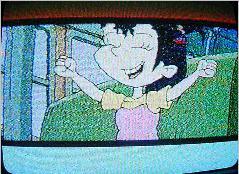 And on 7/21/2001, the loyal Rugrats fans, and the Nielsen families, have spoken. Beacuse of the ratings, it's very likely that Nick will make the tweenage Rugrats a regular part of Nick. So much for "one time only". After all, the concept of seeing our popular charcaters at an older or younger age isn't original -- we shouldn't forget the teenage Pebbles & Bamm-Bamm (CBS, 1971-76) or, going the opposite direction, Muppet Babies (CBS, 1984-92), The Flintstone Kids (ABC, 1986-90) or A Pup Named Scooby Doo (ABC, 1988-93) -- Pebbles & Bamm-Bamm dealt with teenage versions of the popular babies from The Flintstones, while the others feature younger versions of the popular characters. Also being proposed is another series where Angelica and Susie attend preschool. This special, to be entitled Pre-School Daze, will serve as the pilot for this proposed series. And the third proposed spinoff is a series featuring Susie and the Carmichael family, who will move from Anytown, California to Atlanta, Georgia in the new series. This new series, tenatively called The Carmichaels, would've been to Rugrats as The Jeffersons was to All In The Family (no, Randy won't be opening up a dry-cleaning establishment). 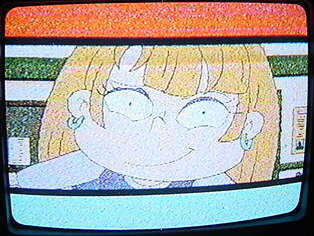 Of course, that proposed concept wasn't new -- it was first proposed for the 1999-2000 television season, but with Nick and Klasky-Csupo deciding to concentrate on all the original-aged Rugrats, all together, that concept was shelved. 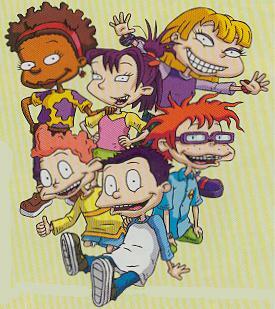 A Rugrats Kwanzaa had served as a pilot for this new series, but with Pre-School Daze likely to go to series, and the original Rugrats staying in production, it would be against logic for the family to move to Atlanta. As for what will happen to the original series when the spinoffs air? Nick plans to keep the original Rugrats series going, alongside the spinoffs. In the TV industry, anything can happen. For details on some of the people that have brought this special to millions of American homes, click here.